St. John's and Grafton had two memorable matchups this year, with the Pioneers barely winning both. Here, Grafton All-American Tyler Reilly looks for room against St. John's star defenseman Aidan Fox. While Central Mass champion St. John's bowed out in the D2 state semifinals, the Pioneers and region as a whole accomplished a ton in 2013. Early next week I will release my Central Mass All Stars, but first, here are some of the highlights from what was a memorable 2013 for the CMass lacrosse community. While nobody in Central Mass could knock off Longmeadow (And uh, neither could anybody else. The Lancers went undefeated), several teams did score huge wins outside of the region. CMass champion St. John's scored, perhaps, the two biggest wins of the year, defeating eventual Division 1 champion Xaverian Bros. 11-8 on May 2nd and Division 1 power Acton Boxborough 10-9 in OT 20 days later. The Pioneers also defeated this year's Western Mass runner-up South Hadley and 2012 WMass champion Minnechaug. But it wasn't just the Pioneers scoring impressive victories beyond Central Mass. Grafton defeated a strong Western Mass program in Amherst-Pelham and Divison 1 Franklin, one of the better teams in the Hocomock. Shrewsbury and Algonquin each pitched in wins over Minnechaug, and Nipmuc defeated Division 1 Natick. 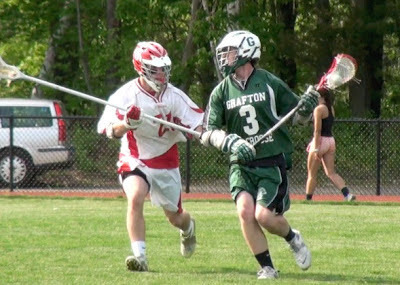 Grafton's All-American duo of Tyler Reilly and Bryan Rotatori saw their high school careers end earlier than they had hoped in the CMass title game, but the two left a legacy like no pair before them in the state's lacrosse history. As BostonLaxNet's Bruce Lerch pointed out to me the other night, both players checked into the top-10 of Massachusetts' all-time scoring list, with Reilly placing fourth at 495 points and Rotatori finishing 10th with 407. This mark's the first time in the state's history two teammates made the top-10 together, certainly no small accomplishment. The two are joined in the top-10 by former Algonquin Tomahawk Brian Cooke, who placed eighth with 429 points. At. No. 18, former Grafton star Dan Rotatori was pushed down the list a bit by his little brother. Rounding out the top-20 was 2012 Algonquin All-American Conor Healy and former St. John's star Colin O'Rourke, who each finished their memorable careers with 346 points. Nipmuc star Colin Jackson also ended his career this season in the 300 Point Club, finishing with 316 points. He placed 32nd all-time, despite spending the majority of 2013 deferring to teammate James Broomfield. The only other CMass alum on the list is Algonquin's Shay Cunningham, who sits at 24th with 335 points. For those of you that don't know, BostonLaxNet is holding its first All-American game this Monday at Harvard Stadium. The game is set to begin at 7 pm, and each $10 ticket sold will go toward helping two great causes, the Wounded Warrior Project and Boston One Fund. I would encourage anyone that loves lacrosse to come out for what should be a really fun day in a great venue. And hey, you get to help out two great causes as well. Anyways, every All-American in the state was invited, but several Central Mass players not named All-Americans were in the conversation for at-large invites. Among them, Algonquin pole Brennan Pierce, along with St. John's pole Aidan Fox, goalie A.J. Arnold and attackman Josh Freilich. The Shrewsbury attack duo of Cam Kerr and Luke Warner were also considered, as was Westboro sophomore middie Jake Foster. But, in the end, there was only room for one, and St. John's star junior Drew Smiley got the invite. Smiley, a Navy commit, was perhaps the region's most physically imposing player on attack this season, and used his rare combination of size and speed to score 76 points (38G, 38A), good for fourth in the region. Smiley will join the Central Mass All-Americans at the game. They are Algonquin goalie Giles Ober, Grafton's Reilly and Rotatori, and Smiley's teammate on attack Hunter Burdick. You can read more about them here. A central band and tie has been closely improved for the use of the concepts for the people. The vital term has been highlighted for the use of the essay writers for hire australia in all ambit and fields for the humans in this time slot. Best MBA assignment writers singapore provides MBA assignment help Ireland services to the university or college students in singapore. We provide every kind of academic help.